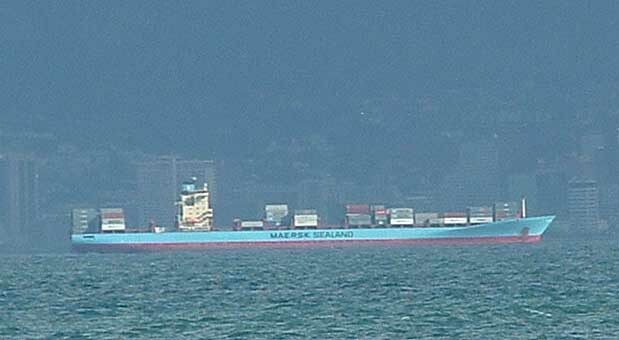 As is usual in Cape Town in the winter months when we have our big winter storms a ship or two will get into trouble and run aground on our coastline.The last ship to do so in Table Bay was the Sealand Express in the winter of 2006. 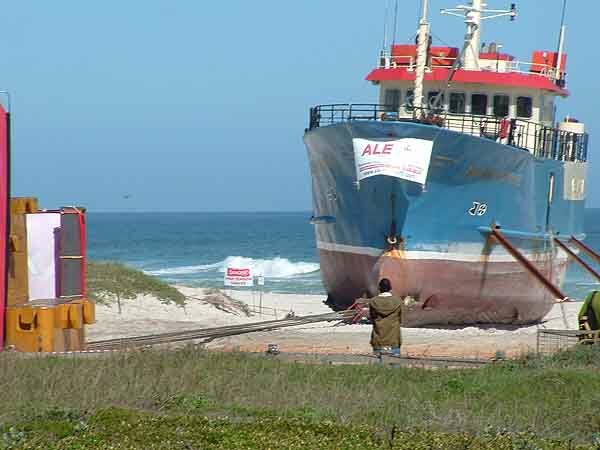 On the 31st of July 2008 with the refloated Sealand Express looking on, two trawlers got themselves into trouble in the rough seas to the east of Robben Island and eventually ran aground about 200 metres apart at Derdesteen on the coastline of Table Bay. When ships get into trouble at sea there is normally more to the story than meets the eye. In this case there seems to be one as well. There are conflicting reports about the two ships and what actually happened . It appears from reports and what I can gather from talk at the wreck sites that the Seawin Sapphire a deep sea trawler with a hold full of tuna and swordfish arrived in Table Bay and was loathe to enter port as she had fish on board that she should not have had. The Weskus 1 a trawler owned by the same company was summoned to meet up with the Seawin Sapphire so that some of the fish could be transferred to her as she was not likely to be inspected when arriving back in port. 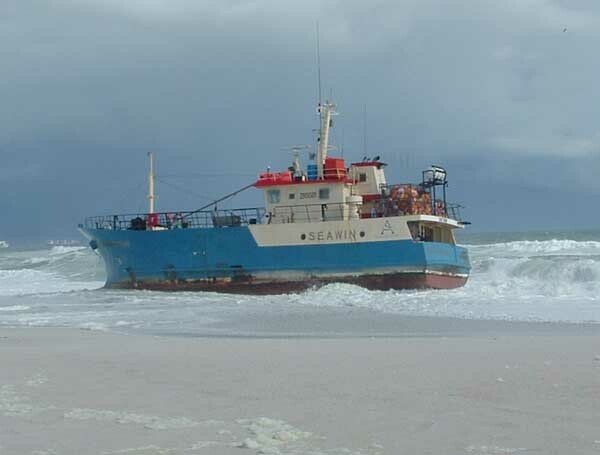 While the two ships were out in the bay attempting to transfer the fish ropes that were holding the trawlers together fouled the the Weskus 1's propeller putting her at the mercy of the sea. Reports in the newspapers confirm that the Weskus 1 propellers were fouled by ropes although there are other reports that she suffered engine failure as well. 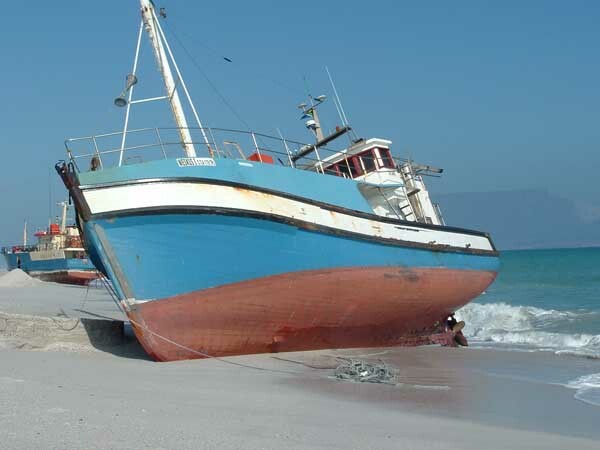 Who other than the crew really know the true story of what happened aboard the Weskus 1. Are these the ropes that fouled the Weskus 1's propeller? 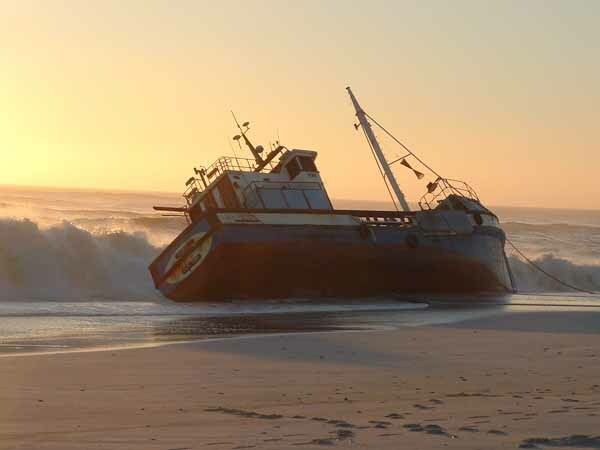 The only true fact that everybody now knows is that the Weskus ran aground at about 5.00pm on the 31st of July 2008 and that her crew had to jump overboard in rough seas to get to the beach, luckily with no loss of life. In the meantime the Seawin Sapphire was also in trouble reporting that she had hit a submerged reef and that her propeller was damaged. 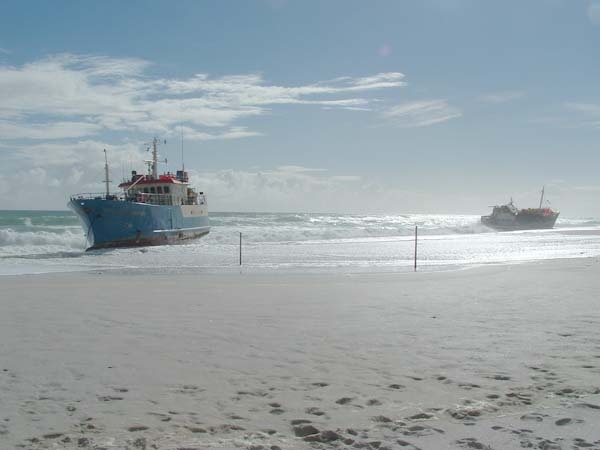 The wind and the large sea that was running soon washed her ashore and she ran aground about two hundred metres from the Weskus 1. The waves breaking onto the beach were large and the 13 crewmen on the Seawin Sapphire had to jump overboard into these large waves to get safely ashore. There were thankfully no casualties and all the crew were rescued from the waves and brought safely ashore. The two ships were now firmly aground on the sand and were being battered by the sea with each big wave driving them further up the beach. Thankfully the weather changed for the better and the authorities were able to get aboard the two ships and unload the equipment and bunker oil on board thus preventing any pollution of the beaches in the area. The estimated 60 tons of fish in the holds of the Seawin Sapphire were also removed and confiscated by the authorities as it was suspected that the ship had been poaching fish. 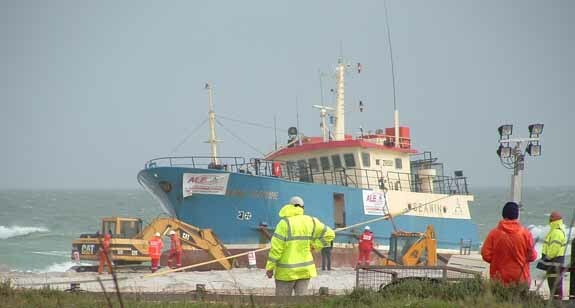 It was now up to the authorities and the owners to salvage the two ships before the weather changed again. Is the sun setting on the Weskus 1 now lying with its deck towards the sea? 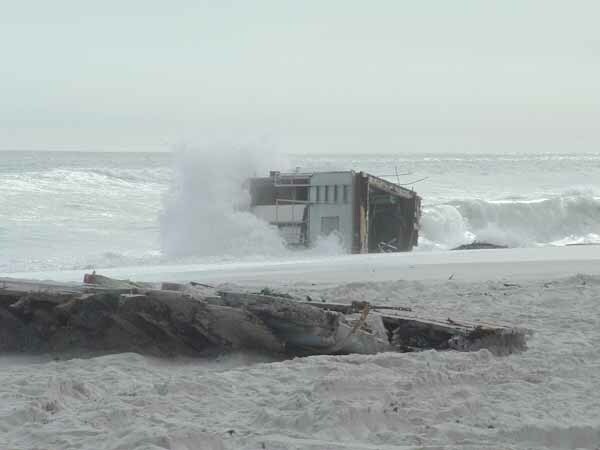 Unfortunately the weather changed again and the Weskus 1 which was lying hull onto the sea was pounded so badly by the waves that she turned over onto her other side so that her deck was facing the sea. She lay on the beach unharmed for a few more days before another storm arrived and the ship was once again pounded by the waves. Around the 12th of August the seas got really big and the Weskus1 started to break up and was soon just driftwood lying on the shore. The local authorities and Nature Conservation did an excellent job protecting the beaches from pollution and by the 13th of August had large containers filled with bits and pieces of the Weskus 1. The cabin that had broken away from the hull was still lying in the sea but as soon as the tide allowed it was pulled up onto the beach and broken up and removed with the other remains of the ship. I'm sure that the Weskus 1 could have been saved from the sea if someone had just decided to pull it up the beach out of the waves. It was a much smaller and lighter ship than the Seawin Sapphire and a bulldozer could have dragged it to safety. Unfortunately it was not to be. In the meantime the larger Seawin Sapphire lodged itself in the sand and managed to withstand the beating it got from the sea while it waited for the salvagers to make up their minds how they were going to remove her from the beach. There were a number of methods discussed, such as pulling her off the beach with a tug, but with shallow seas along the coastline and hidden reefs it was decided that there was a possibility that the tug could also get into trouble so the idea was shelved. 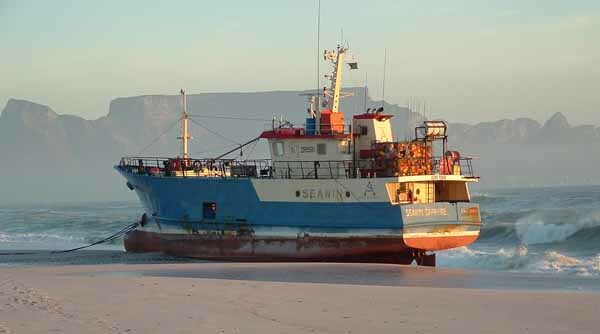 In the end it was decided that the Seawin Sapphire would be pulled up onto the beach using heavy duty pulling equipment and once she had reached the parking lot at Derdesteen she would be loaded onto a trailer and removed to the Table Bay harbour by road. Around the 19th of August 2008 preparations to pull the Seawin Sapphire up the beach began in earnest. A heavy duty rig was installed in the parking lot at Derdesteen and using a block and tackle type of arrangement the Seawin Sapphire was first turned so that her bow faced the road. This took the salvagers about two hours to do with the pulling power of the rig and the help of a number of mechanical diggers moving sand out of the way to enable the ship to turn. As the tide was pretty high at the time the sea lifted the ship off the sand every time a wave broke over her and assisted with the turning of the ship. Once the ship had been turned it was necessary to change the shackles and the cables pulling the ship to pull from both sides of the ship to get it moving in a straight line. Overnight the ship was painstakingly dragged up the beach and by the afternoon of the 20th was a metre or two from the parking lot. 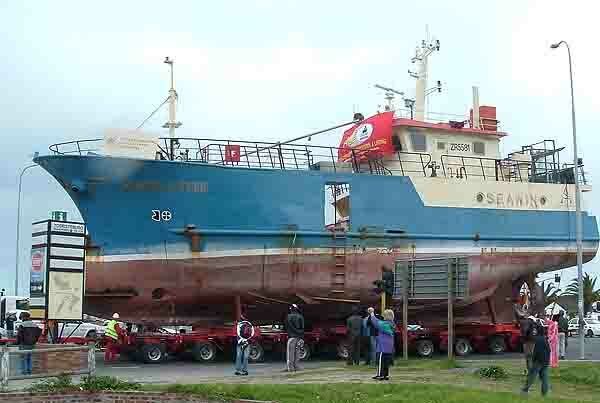 The ship was eventually pulled into the parking lot and from there was lifted off the ground so that a trailer and dolleys could be rolled in under her. It took two days build the trailer and lift the ship onto it. Once on the trailer the ship was secured by welding stays onto its hull and onto the trailer as well as with chains around it to stop it moving. Sometime during this process the propeller which was apparently damaged when it hit a submerged reef was also removed from the ship. 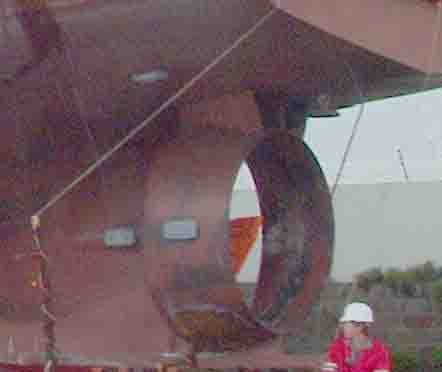 The metal ring surrounding the propellor known as the Kort Nozzle is undamaged so how could the propellor have hit a rock? 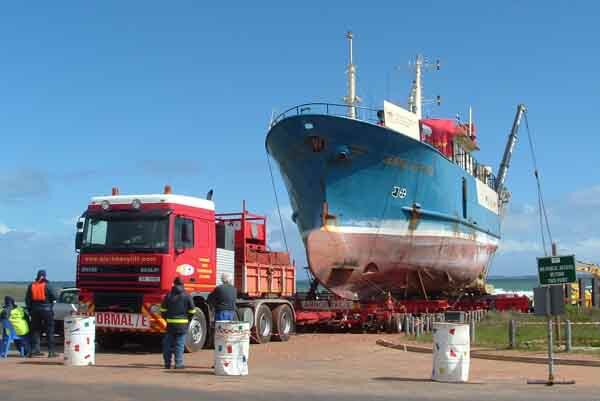 Eventually on the 25th of August 2008 the Seawin Sapphire was ready to be removed from the beach and begin its journey through the streets of Cape Town back to Table Bay Harbour. The rig pulling the 88 wheel trailer and ship had two trucks linked together pulling it at about 8 kilometres an hour. The route taken by the convoy of police and traffic officials into town was quite an involved one and had to be clearly thought out as the height of the Seawin Sapphire on the trailer was nearly the same as that of the street lamps lining the route. It would have been impossible to remove overhead wires and street lamps to allow the ship to pass. The route followed was from Derdesteen into Melkbosstrand and then along the west coast road to Blouberg Road in Table View where the convoy turned eastwards to get to Koeberg Road. Once on Koeberg Road it went as far as Boundary road where it turned westwards to get back onto Marine drive to enable the ship to enter the harbour in Paarden Eiland. After a journey lasting nearly eight hours from Derdesteen the ship finally entered Table Bay Harbour where she will be unloaded from the trailer and repaired before being refloated. Following this drama has been a really interesting experience for me and I hope you have enjoyed the article and photos I have put on this webpage for you.